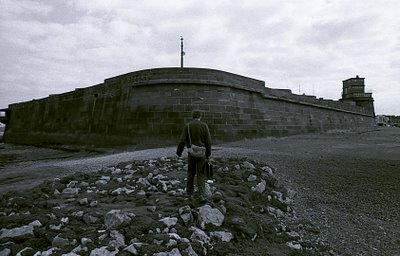 Nicknamed the 'Little Gibraltar of the Mersey', the coastal defence battery of fort Perch Rock has stood on a natural sandstone outcrop at New Brighton for over 170 years. The town of New Brighton was laid out by James Atherton in 1830, prior to this the area was a desolate and rocky foreshore. During the 18th century in times of war, cannon were brought here to defend the Port of Liverpool. During the Napoleonic wars Liverpool merchants lobbied for more permanent defences, but following the defeat of Napoleons navy at Trafalgar in 1805 fears subsided and nothing was done. In the 1820's plans for a permanent battery were drawn up by a Captain Kitson and work was started in 1826. The fort is built of sandstone quarried localy and at Runcorn. The fort with accommodation for 100 men opened in 1830 and had cost £26,965 0s 8d. Armament consisted of sixteen 32lb cannon facing the sea and two 8lb cannon defending the fort from landward. In 1861 the 32lb cannon were replaced with 68lb cannon mounted on granite sets which can still be seen inside the fort. By the 1890's these cannon had become obsolete and between 1894-1899 the fort was remodeled and three mounted 6 inch guns were installed plus an observation and firing post in the east tower. The seaward walls were lowered 15 feet giving the fort its present appearance. During its history no shots were ever fired in anger. However when the guns were fired shop windows in New Brightons Victoria Road would often shatter due to the vibrations transmited through the rock strata. 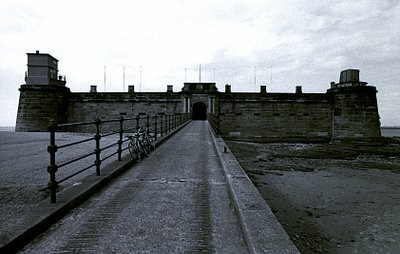 WWII proved the end for coastal defence batteries as air power took over the role, and in 1957 the war department put the fort up for sale, it being bought (for less than the cost of its construction) by local business men. It is now privately owned and houses a collection of WWII aviation relics. Thanks for sharing the awesome history along with the beautiful photos, Keith ... that's wonderful that the structure is still being put to use. I sure hope I make it over to England to visit my brother sometime - I'd love to visit these places in person. Hi Peggi, I hope so much you get to visit your brother and see some of England for yourself. Glad you enjoyed these photos and the information. I'm going for a short vacation in Canada so this will be my last post until I return. Hope you have a safe and fun trip -be sure and take lots of pix (probably I don't even have to say that lol =) Enjoy! I like that pictures and I want to go someday UK and Europe. I really love old structure. Peggi, thanks for the wishes, I'm sure I'll manage to take one or two photos. H.O., thanks for your comment, I'm glad you like the photographs, hope you get to visit the U.K. and Europe some time. I would be happy for you to link my blog. Got to go finish packing, thanks again to you both.